This is a scrapbooking page that we will be making at our next class but for those of you that will not be there, I wanted to share it. It's my dedication to my beautiful, loving, wonderful Mom. The colours on my page are Cameo Coral, kiwi kiss, pretty in pink and pink pirouette. 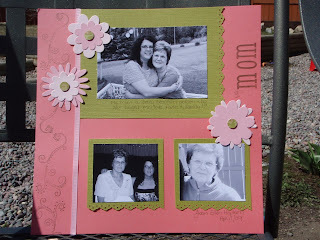 The flowers were cut out using my sizzix big shot. 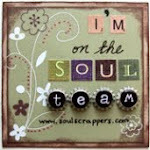 I used choc chip ink and stamped along the side of the page with a stamp from Doodle This. I also used the eyelet punch along the edge of the kiwi paper. I thought black and white photos looked best to co-ordinate everything.